Pirate Sword Set for sale features two short swords. The sharpened short swords are crafted of stainless steel and measure 20 inches in length. They have a deep blood groove and feature cast metal guards. The wall mount is made of hand painted poly resin in the shape of an intricate pirate skull. The short swords conveniently fit through the pirate skull for a truly unique display or can be removed and displayed separately. Please note: Mounting hardware is not included with the display. 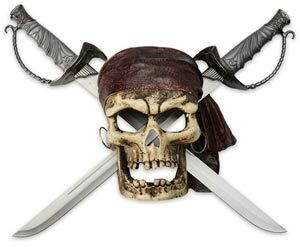 Buy the Pirate Sword Set with pirate skull display for $59.99.